Crazy new emoticons and buttons to replace the current ones found in the Furcadia console. Alternate Tri-Colors Patch : Gives felines, canines, and rodents different Tri-Color wings, similar in form to Classic Wings. Rose-Colored Glasses : Modifies your Furcadia game appearance, turning everything pink! Includes a screenshot preview of the patch. Feral Horse Patch : A collection of images to be used in a patch of your choice. Not for beginners, as it contains .bmp files to add manually. AlaWings : This is a patch for classic winged felines, used in Water City's Nerothean Festival. Also includes one winged musteline pose. Club Kickin : This is the official patch from the popular Club Kickin dream. It includes lazer lights, modified from Raithen's Furcadia Live! patch, fog makers, gray appliances, tables, festively colored chairs, balloons, and fish tanks from Merle's The Beat patch. Also comes with a Marbled.pcx that changes the appearance of your Furcadia screen. Wrinkled Cloth : Modifies your Furcadia game appearance, creating a wrinkled effect to the background and buttons of Furcadia. Water Wonderland : This patch includes floral walls, cattails, waterlillies, a waterfall, and two fish items perfect for a garden pond. Unicorn Fuzz Puff Balls : Affects un-winged felines. Also comes with classic winged players. Halloween-style Dragon Breath : The original Dragon Breath is modified into orange pumpkins. Red Pheonix Flames : The original orange Pheonix Flame turned red. Kimonos for Lapines : Includes a kimono walkabout for felines and an alternate portrait. Bats : Unwinged rodents are changed into bats, complete with portraits for all genders. Alcohol Patch : Various alcoholic beverage objects for the responsible adult furre. Chibi Bunnies : This patch shrinks Lapines (player5.fsh). Beasts of the Sea : This patch contains several large and small dolphin and whale objects. Winter Patch : This patch is a compilation winter patch which went with a winter dream for Danival's Winter Dream Contest 2002. The dream and patch won an Honorable Mention. Mystical Furre Avatars : This patch changes Rodents to Gryffes(the original style, not the currently-released ones), Equines to Unicorns, Felines to Chimeras, Canines to Dragons, Mustelines to Felitaurs, and Lapines to the new-style Phoe. All complete with matching specitags and portraits! The portraits and walkabouts were drawn by various artists. Hyoomans in Furcadia : This patch by Heroh Ti'Mouse turns furres into human avatars, complete with a portrait set. Also includes chicken and lizard/kiwi avatars with portraits. AlternaWings : A compilation by Athene: the Butterflies are from Jaguarbie's rodents with wings and altered by Tsumerai for felines; the musteline bat wings and canine fairy wings are Merle's, and the dragon equine wings are by MedleyPony. Far East Furcadia : A far east theme patch, right down to the rice paper walls and laquered tables. Includes various items such as paper lanterns, red columns, anime pookies, sake bottles, a water lilly, pink flower tree, sushi tables, and cots. A Mini-Patch : I made these walls and floors with the intention of using them in a Christmas dream, but never really completed it. I hope someone else can get better use of them ^.^ I imagine they would also be ideal for a hotel, or a rich furre's manor house. The patch is not for beginners though, it contains .bmp files to be added into any floor or wall fsh file, manually. Fixed ArchAngel Wings : This patch applies Tri-Wings to laying down canines in Kestrel's ArchAngel Canine wing patch. Affects unwinged canines. Theriopolis Patch : Bridges, food carts, fishing poles, lily pads, and so much more! For a preview of this patch, visit Theriopolis, located in Imaginarium. Credits: Diremoon and friends. Music by sanctimonious. Jujinka's Spring Festival Patch : Includes various peddling carts, sittable flowers, maypoles, and more spring fun! Made especially for the 2002 Jujinka Spring Festival held in Meovanni. Contributions by Beekin Pixels. Silver Sponsorship Dream : The official Silver Sponsors patch, located in the Silver Showcase dream in AI's Hall of Dreams. Includes portraits, jungle atmosphere, and caves! Contributions by Masons and Pixels. (Specific credits in readme.txt). Rameen Festival : This patch was used for the official 2002 Furcadia Rameen Festival. It includes items from Oviedo and Jefurre's (among others) Beekin Beach Party patch: surfboards, Sanctuary's Animal Carousel, sandcastles in the form of primes, starfish, innertubes, and even a fish fry! Contributions by Masons and Pixels. Zefiroth : The patch from the secret Fall 2002 map now made public in Furcadia. Following a winged creature theme, it includes clouds, floating islands, columns, portals, a chaise couch, rainbows, and large statues of the Furcadian Primes. Art by Kestrel, Oraclese, and Marah~Fae. Wolf Howl : The Wolf Howl was an event held around Halloween of 2002. Meovanni Village was transformed for the weekend into a harvest-time atmosphere, with pumpkins, eerie spiders, and bales of hay as decoration. Each player was transformed into Talzhemir's Wolf avatar and could "howl" at each other. Included in this patch are these howls, decorations, and avatars as well as creepy smiley faces and cob-webbed walls. Egyptian Festival Patch : The patch from the 2003 Egyptian Festival, honoring our Prime of Felines, M'Rill, including various marketplace items, a Senet board, a barge, and much more. Player3.fsh & Portrait3.fsh are both part of my cow patch that turns all dragons into cows. Moo. Player.fsh is a Final Fantasy 1 (8-bit! Nintendo rawks!) patch, in which all wingless furres (not including lapines and the specials!) turn into characters from the good ol' ancient FF1 game! 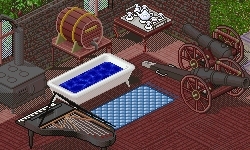 Cannons and Things : Included here is the open/close grand piano, which I originally created. Altered, colored versions of it have been seen in some dreams, which I don't mind if credit is given. The most notable versions are the brown one and the glossy black one made by Corsyus (both not included). The field cannons come in four different orientations. The rest is for ambiance. Mixed Wings : This patch combines Kestrel's Archangel Wings for canines and Fairy mustelines, Jagu's Butterfly Wings modified by Tsumerai for felines, Fire Wings for rodents and Warrior Flies for equines by Siana Myste. Sports Items : Items perfect for any sporting event. Includes goals, balls, and sticks. The Sanctuary Patch : Items by Talzhemir, portraits and walls completed by Ayeka. This patch includes beautiful flowers, huge trees, music, kitterwings, plus more! To get a glimpse of this patch visit Sanctuary, located in Allegria's Hall of Dreams. Also with item contributions by: Zephyr, Hoshi Himura, Ryhn, Kuera, and Seraphiel. The Sanctuary Carnival Patch : Complete with colorful balloons, various carnival music, carousal animals, various games, a kissing booth, and even a dunk tank! This patch will be sure to make your dream's carnival more eventful! Contributions by: Youlanda, Shadraw, Seraphiel, Zephyr, Kuera, Ryhn, and Hoshi Himura. AltWings: NiteFall's wings for all classic winged furres, plus stripe markings; also, fixed wings while laying down. Classy Marbled : Modifies your Furcadia game appearance. Chocobos : Chocobos are a bird like creature featured in Squaresoft's gaming series Final Fantasy™. This patch contains Corsyus' items of sittable Chobobos in various colors. Moogles : Moogles, or Mogs, are characters from the Squaresoft game series Final Fantasy™. The name "moogle" is from the words "mogura" and "koumori" which mean mole and bat respectively. This patch turns non-winged mustelines into Corsyus' rendition of the Moogle. Rivendell Castle Patch : A compilation of various medieval items from patchers such as Kestrel, Youlanda, Gin Blossom, and Corsyus himself. Includes water tiles that 'ripple' when you walk upon them and the adjoining DS explanation. Stonehenge Patch : Modifies your Furcadia game appearance into a Stonehenge theme, complete with background, buttons, and emoticons. Illusion Patch : Through the careful placement of one off-kilter pixel, the patch creates a very crazy effect! This tile will show up black in your DreamEd. Also comes with five disco floors, one health warning tile, one white tile, and dream and DS to show how the patch works. Trenchcoats for Canines : Original trenchcoats by Jagu (see Trenchcoat Patch) - this patch was modified for un-winged canines. Dracolich Patch, Undead Dragons : Tranforms Furcadia's default dragon (art by Kestrel) into a boney frame, complete with a matching portrait set. Toon Animals Patch : Changes the player.fsh, portrait.fsh into toon-like 3D animals including mice, cats, dogs, ferrets, and rabbits. Also comes with small pet-like items and walls for these avatars. Love Seats : Merle created the original significantly smaller seat, and these are made based on the Psychoanalysis chairs that was created by Kalyanii. Winter Patch : Contains winter versions of all the Sanctuary flowers and trees and also the 128-144 object trees (found in the default item.fsh), although you have to individually place them all - and a few others tossed in. The floor patch is from the furfal97 patch by Talzhemir, the sand from Youlanda. Autumn Patch : Contains autumn versions of all the Sanctuary flowers and trees and also the 128-144 object trees (found in the default item.fsh), although you have to individually place them all - and a few others tossed in. The floor patch is from the furfal97 patch by Talzhemir. Anime Faces and Items : Contains Zelli's "Toy Patch" as well as a slew of other small sprites, 80s cartoon characters, and anime characters. Cardboard Box Player Patch (All Species, Except Lapines) : Affects all player.fsh avatars. All Species Capes Patch : Combines Roland's capes for equines and Jagu/Israfel's capes for felines with modified capes for rodents, mustelines and canines. Wacky Player Patch : Transforms the normal avatars into wacky looking players! This page, subsequent pages and all content therein, unless otherwise stated is copyright © Dragon's Eye Productions. Site maintained by The Beekin Scribes. Special thanks to Rydia and Kalyanii.